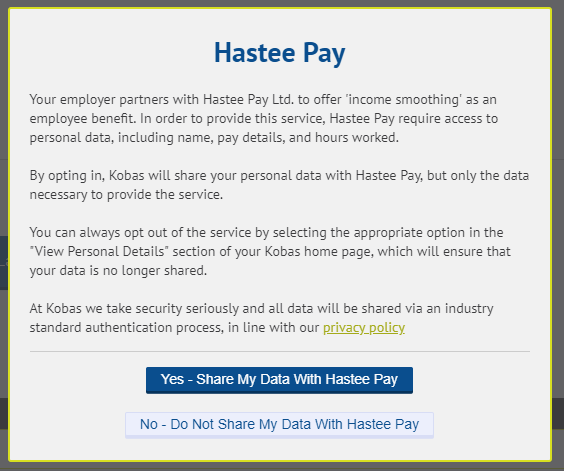 Hastee Pay integrates with Kobas to get live and accurate information on pay earned to date, based on shifts that have been approved in the Kobas Rotas module. This data then allows Hastee Pay to offer these employees up to 50% of the wages that they have earned, through the hours that they have already worked. As ever, this is backed by Kobas’ characteristically fastidious attention to data protection, meaning that users must opt-in to Hastee Pay before any information is revealed. They can also choose to opt-out at any time, within the staff personal details section of the Kobas homepage. Set-up is simple. Once switched on in Kobas Cloud, API credentials are revealed which – when provided to Hastee Pay – will link your two accounts. This will immediately allow users to opt-in to the service, start sharing their data with Hastee Pay, and receive their wages when they need it. Hastee Pay charges no interest, just a small one-time fee, or a flat-rate monthly subscription, helping employees avoid high-cost credit and debt. For employers, Hastee Pay simply invoices for the employee’s wages at the end of the pay period, making it a completely cashflow neutral solution. So, to help improve choice and financial well-being for your employees, and to reap the benefits of an engaged and productive workforce, get in touch with Hastee Pay today.